The handshake is a greeting, a consent, an affirmation, an agreement.It is an intersection where a momentary union signifies a mutual promise. This project addressed the curious and important intersections of inventory,information, small talk, chance, social contract and the signs of basic civility. 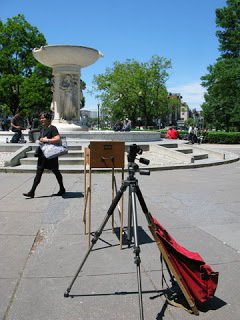 Workingman Collective transformed a four-drawer oak filing cabinet into a portable water cooler/movie theater and transported the object/set-up to different locations in the city in order to collect and inventory a working-day’s worth of handshakes. The completed Cooler-Shake offered a series of 8-hour video loops of handshakes between the members of Workingman Collective and the public.